An evolutionary dinosaur expert reveals some fascinating facts! Even millions of years might, to some, not even seem long enough to allow for natural processes to gradually, molecule by molecule, replace the original substance of the bone with rock minerals. So even a rock-solid, hard shiny fossil dinosaur bone, showing under the microscope that all available spaces have been totally filled with rock minerals, does not indicate that it necessarily took millions of years to form at all. Now of course if a dinosaur bone is indeed permineralized, it would give it great protection from the normal processes which cause things such as bone to just naturally ‘fall apart.’ So a permineralized bone might indeed be anything from a few weeks to millions of years old. However, in a situation where the dinosaur bone has been prevented from being invaded by mineral-rich water, one would expect that over millions of years, even locked away from all bacterial agents, dinosaur bone would, in obeying the laws of thermodynamics,3 just disintegrate from the random motions of the molecules therein. The nodules prevented water from invading the bones, which for all intents and purposes cannot be distinguished from modern bone. This is a stunning revelation. Evolutionists are convinced that all dinosaur bones must be at least 65 million years old. Those who take Genesis as real history would predict that no dinosaur bone is more than a few thousand years old, so the existence of such totally unmineralized dinosaur bones that have not disintegrated is perfectly consistent with our expectations. Most fossil dinosaur bones still contain the original bone. Even when heavily permineralized (‘fossilized’), this does not need to require more than a few weeks. The Creation/Flood scenario for fossilization would allow many centuries for such permineralization to occur, even under less than ideal conditions. Where bones have not been protected by permineralization, they are sometimes found in a condition which to all intents and purpose looks as if they are at most centuries, not millions of years old. The Bible’s account of the true history of the world makes it clear that no fossil can be more than a few thousand years old. Dinosaur bones give evidence strongly consistent with this. 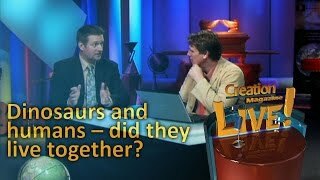 Dinosaurs and humans -- did they live together? Currie, P.J., and Koppelhus, E.B., 101 Questions about Dinosaurs, Dover Publications, 1996. Currie is a well-known dinosaur authority. He is Curator of Dinosaurs at the Royal Tyrrell Museum of Palaeontology, Drumheller, Alberta, Canada. Koppelhus is a visiting researcher at the same institution. Return to text. Ref. 1, p. 11. Return to text. The Second Law of Thermodynamics formalizes the relentless tendency of all systems to strive toward the most probable arrangement which, in the absence of some specific ordering agent, is the one in which the molecules exhibit the maximum disorder. For more information, see The Second Law of Thermodynamics. Return to text. Ref. 1, p. 12. Return to text. 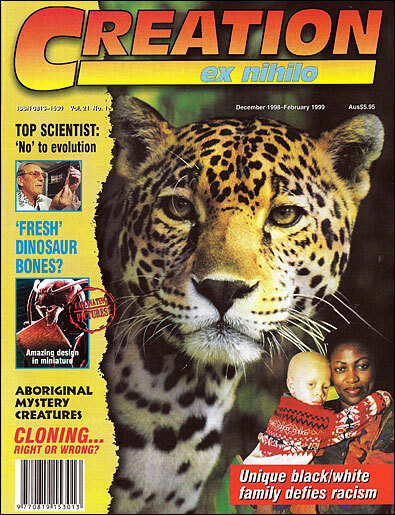 Wieland, C., Sensational dinosaur blood report!, Creation 19(4):42–43, 1997. Return to text. Helder, M., Fresh dinosaur bones found, Buddy Davis: The creation music man who makes dinosaurs, Creation 19(3):49–51, 1997. Return to text.